The College of Engineering at my alma mater, Texas Tech University, sends out a quarterly newsletter to its alumna. 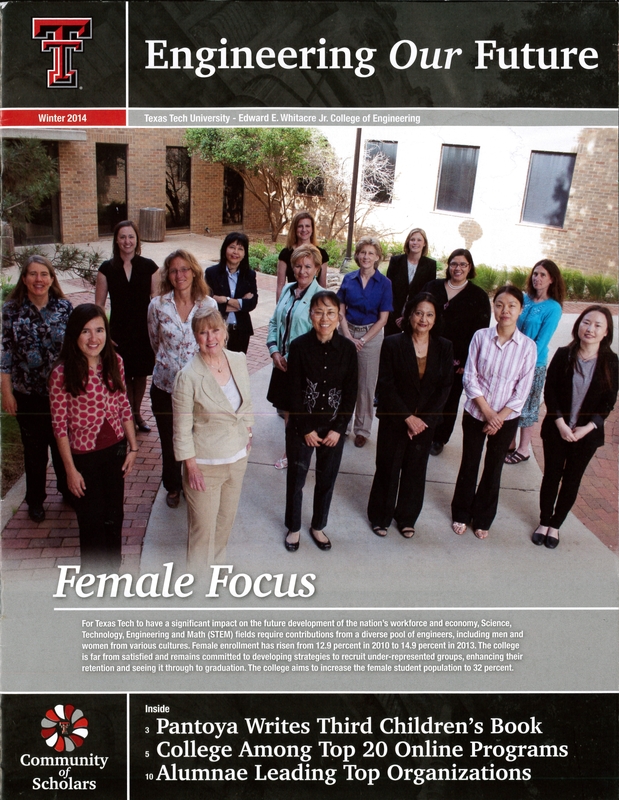 The most recent issue theme was “Female Focus” and covered the efforts at outreach, recruit, and retention, and had several feature pieces on female engineering professors and students associated. One piece was about Dr. Michelle Pantoya, a professor of mechanical engineering, who has written several children’s books teaching basic problem-solving skills by using engineering concepts and vocabulary. Two of her books can be found on Amazon: Designing Dandelions: An Engineering Everything Adventure, (with Co-author Dr. Emily Hunt) and Engineering Elephants, both aimed at 4-to-8 year old children. (You can also order her book Electrostatic Discharge Sensitivity of Composite Energetic Materials: Examining Correlations of Electrostatic Discharge Sensitivity, Electrical Conductivity, and Particle Size). Another Tech engineering graduate and, later professor, Dr. Mica Endsley was recently named chief scientist for the United States Air Force, working on technical issues. While I was happy to see that the college has set a goal of increasing the percent of female students to 32%. I don’t know what that means in actual terms, though. They don’t say they aim at a graduation rate of 32% female. When I enrolled in my chemical engineering program, there were around 130-150 students in the sophomore class, and perhaps 25% of them were women. Three years later, the number in my class who graduated was in the low 50s, and there were three women – less than 10% of the class. When my friend’s daughter graduated from the same program exactly 30 years later, there were less than 10% women in the graduating class. Thirty years, and little had changed. I’m not sure why more women do not enter the engineering field. Although female enrollment in STEM is up, my informal investigation shows that it is heavily weighted to the S, and that it’s primarily the “squishy” sciences that are up. Biology, for instance. I’m completely unqualified to know if the country needs more bachelor’s degrees in biology, but I do know that we are in desperate need of more E.
Note, those are STARTING SALARIES, for 22-year-old graduates with no experience, beyond perhaps a summer intern position. I want young women to enter careers. The same article said that over 50% of new graduates are unemployed in their field. If I was going to school to study something I loved without regards to employment potential, I’d study medieval European history or culinary school. Perhaps it’s my analytic training, but I’d look at the dollars expended for a degree compared to whether or not it will directly benefit me. School is too expensive, and life too short, to not evaluate these things. The jobs are interesting and usually plentiful, the work often exciting, the U.S. needs engineers to move forward (or even to stay in place!) Perhaps it’s that, Howard Wolowitz aside, young people just don’t understand what engineers do. Perhaps it is my being in the Seattle area, where many engineers are in aerospace, but we have a very cyclic job market in engineering. You MUST be willing to relocate and/or squirrel away money for the predictable bout of unemployment if you go into engineering. Maybe it’s different in petroleum engineering, I don’t know. The female engineers I know have experienced frustration with being treated with, if not exactly disrespect, a lack of equal respect to their male counterparts. Again, that’s not a deal-killer, but I can see where it would put some young women off from completing their degrees. I am one of those ‘started but didn’t finish’ and it was largely due to the peer group I had to deal with: I looked at the graduating seniors and said, “I don’t want to turn out like *that*,” and changed majors. Perhaps it is better now? Having said all of that, I agree we need more women in hard science and engineering; and we need more good engineers overall. But to get that, we need to have better emphasis and teaching of STEM subjects at the middle and high school level. We need to find a way to combat the self-exclusion from mathematics that too often occurs in high school for girls. The petroleum business is also cyclical. My degree is in chemical engineering, so theoretically I have a choice of many different industries to go into, although after you’ve worked in one area for 20+ years, you’d have to convince a potential employer that all of your skills and experience are transferable (sure, making peanut butter is EXACTLY like making gasoline!!!) Being willing to relocate is important in many careers. It’s probably why there is great unemployment in parts of the country while others (in the energy producing states) are begging for people to come to work – some people don’t want to move. I think most of my grad class, all men except for the three I mentioned, didn’t care for me. I don’t know if they respected me or not, but since I didn’t care what they thought of me, I am not sure it mattered. A couple of my professors actually tried to dissuade me, but I also ignored them. I figured I graduated in spite of them.